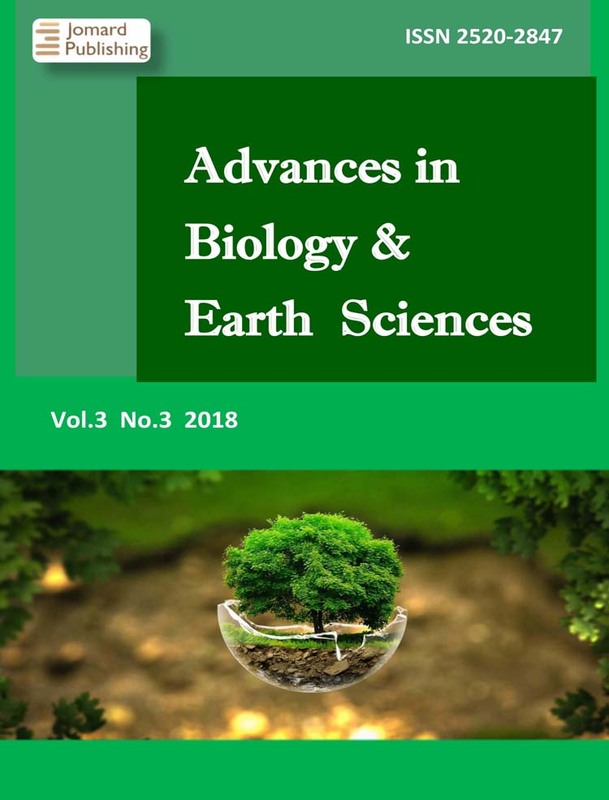 Advances in Biology & Earth Sciences provides immediate open access to its content on the principle that making research freely available to the public supports a greater global exchange of knowledge. However please also see our copyright statement. The journal is published three times in a year: in April, August and December. The publication schedule is strongly followed. Advances in Biology & Earth Sciences and its publisher Jomard Publishing, LLC adhere to the principles of the Committee on Publication Ethics (COPE) and follow the COPE Code of Conduct and Best Practice Guidelines for Journal Editors and the Code of Conduct for Journal Publishers. The journal also follows recommendations contained in A Guide for Editors-in-Chief, Associate Editors, and Managing Editors. The journal and the publisher expect that authors, peer reviewers and editors follow best practices of ethical behavior contained therein. Most important points are presented below, but it is advisable to refer to original documents above. Editors evaluate manuscripts submitted to the journal based solely on their merit (importance, originality, study’s validity, and clarity) and its relevance to the journal’s scope, without regard to the authors’ race, gender, sexual orientation, ethnic origin, citizenship, religious belief, political philosophy or institutional affiliation. Decisions to edit and publish are not determined by the policies of governments or any other agencies outside of the journal itself. The editor-in-chief has full authority over the entire journal’s content and the timing of its publication. Editors and editorial staff will not disclose any information about a submitted manuscript to anyone other than the authors, peer reviewers, potential peer reviewers, other editorial advisers, and the publisher, as appropriate. Unless explicitly permitted by the authors in writing, editors and members of the editorial board will not use any unpublished information disclosed in a submitted manuscript or ideas obtained as a result of handling the manuscript for their own purposes and advantage. Editors will choose not to consider manuscripts in which they have conflicts of interest resulting from competitive, collaborative, or other relationships with any of the authors, companies or institutions connected to the papers. The editors ensure that all submitted manuscripts being considered for publication undergo peer review by experts in the field. The editor-in-chief is responsible for deciding which of the manuscripts submitted to the journal will be published, based on the validation of the work in question, its importance to researchers and readers, the reviewers’ comments, and legal requirements. The editor-in-chief may consult other editors or reviewers in making decisions. Editors will take responsive measures when ethical concerns are raised with regard to a submitted manuscript or published paper, even if the issue is discovered years after publication. Any invited reviewer who feels unqualified or unable to review the manuscript due to the conflict of interests should promptly notify the editors and decline the invitation. any substantial similarity or overlap with any other manuscript (published or unpublished) of which they have personal knowledge. Confidentiality. Reviewers should treat the contents of the manuscript under review as strictly confidential, not to be disclosed to others prior to publication. A reviewer should not use or share with others material from a manuscript he/she has reviewed. Nor should a reviewer distribute copies of a manuscript under review, unless it has been made public. Reviewers will not use any unpublished information disclosed in a submitted manuscript or ideas obtained as a result of handling the manuscript for their own purposes and advantage. Conflicts of Interests. Reviewers are requested to inform the editor of any conflicts of interest in reviewing a manuscript. Such conflicts of interest can occur if the reviewer is asked to referee a paper written by a colleague of the same organization, former or current student, former advisor, or closely-related person. Another type of conflict occurs, for example, when the reviewer is a direct competitor of the author of the paper for a grant. If the conflict is severe, the reviewer should recuse himself/herself. Authors must ensure that they have written and submit only entirely original works. If authors have used the work, information, or words by others, this must be appropriately cited. Authors should not copy entirely or in part any work or manuscripts by others and submit as the author's own. Copying or paraphrasing substantial parts of another's paper (without attribution) must be excluded. Plagiarism in all its forms constitutes unethical publishing behavior and is unacceptable. Duplicate publications, redundant publication, text recycling, and self-plagiarism are also inappropriate practices and should be avoided. Papers describing essentially the same research should not be published in more than one journal or primary publication. Hence, authors should not submit for consideration a manuscript that has already been published in another journal. Submission of a manuscript concurrently to more than one journal is unethical publishing behavior and unacceptable. have seen and approved the final version of the paper and agreed to its submission for publication. All persons who made substantial contributions to the work reported in the manuscript (such as technical help, writing and editing assistance, general support) but who do not meet the criteria for authorship must not be listed as authors, but should be acknowledged in the "Acknowledgments" section. The corresponding author should ensure that all appropriate coauthors (according to the above definition) and no inappropriate coauthors are included in the author list and verify that all coauthors have seen and approved the final version of the manuscript and agreed to its submission for publication. Authors should disclose any conflicts of interest that might be construed to influence the results or their interpretation in the manuscript. Potential conflicts of interest that should be disclosed include financial ones such as honoraria, educational grants or other funding, participation in speakers’ bureaus, membership, employment, consultancies, stock ownership, or other equity interest, and paid expert testimony or patent-licensing arrangements, as well as non-financial ones such as personal or professional relationships, affiliations, knowledge or beliefs in the subject matter or materials discussed in the manuscript. All sources of financial support for the work should be disclosed (including the grant number or other reference number if any). Authors are obliged to participate in the peer review process and cooperate fully by responding promptly to editors’ requests for raw data, clarifications, and proof of ethics approval, and copyright permissions. Authors should respond to the reviewers’ comments systematically, point by point, and in a timely manner, revising and re-submitting their manuscript to the journal by the deadline given. When authors discover significant errors or inaccuracies in their own published work, it is their obligation to promptly notify the journal’s editors or publisher and cooperate with them to either correct the paper in the form of an erratum or retract the manuscript or article. If the editors or publisher learns from a third party that a published work contains a significant error or inaccuracy, then it is the authors’ obligation to promptly correct or retract the paper or provide evidence to the journal editors of the correctness of the paper. Papers submitted to Advances in Biology & Earth Sciences will be screened for plagiarism using CrossCheck/iThenticate plagiarism detection tools. Apart from that we check with Copyscape for plagiarism. Advances in Biology & Earth Sciences will immediately reject papers leading to plagiarism or self-plagiarism.